Breath of Fire is essentially Capcom's ode to the Dragon Warrior series, except instead of just fighting the dragons and monsters this time, you get to turn into them and have them in your party. Where's the fun in just playing as humans when you can have a guy who turns into dragons, a girl with wings, a lamia lady, a fishman, a mole, and several other weird wolf and ox-like beings. There is even one seemingly ordinary human who can learn skills to fuse several of your characters into one super-powerful form. The whimsical character designs bring functionality, not just form to the plate. The winged girl can turn into a bird that flies around the world. The ox can break down walls and knock fruit from trees. The wolf can hunt animals for rare items on the overworld. You'll need the abilites that your party accumulates to backtrack to earlier areas and find things that were hidden, but couldn't be retrieved at the time because you didn't have the right skills yet. Capcom really wanted you to fully explore and learn the game's world. So much so, that if you don't, you can't fight the true final boss and see the good ending. My suspicion is that unless they look it up, most players will stumble upon what they need to properly finish the game the same way I did...and it's a huge, "WTF is this?!" moment. I get the feeling that Capcom had similar Disney envy when they made this game that Square did when they designed Secret of Mana. Much like that game, a lot of the appeal is in the visual design - large colorful, fully-animated enemies and bosses dominate the battle scenes. The environments aren't quite as spectacular as Secret of Mana's, but there's still an amazing amount of detail in the overworld graphics, especially when compared to Square's own Super NES Final Fantasy games. The thunderous soundtrack is decent, and the story is...well, once again we have an evil empire that's trying to resurrect an ancient power at all costs and it's made more interesting by the humorous character interactions and a mysterious usurper to the evil emperor's throne. Funny thing is that from the very beginning of the game, you're trying to reach Scande, where the Dark Dragon's empire is located. It always seems like you're just about to get there, but something always messes up the plans and the characters end up in a lot of strange situations as a result. When you finally do arrive at Scande, there's an overwhelming feeling of, "Can I really be here after all this time?" 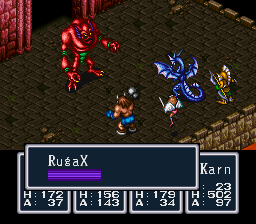 Aside from one strangely difficult Gremlin near the beginning of the game and the last few bosses, Breath of Fire's boss fights aren't very hard because as your party grows and gains new skills, it far outpaces almost anything the they can throw at you. But I don't think the boss fights are the game's main challenge - finding everything and just figuring out what to do in many situations is where the real difficulty lies. The game even makes up for it somewhat by having unique dungeon designs that make navigation tricky - one has walls that disappear, another has rotating floors. 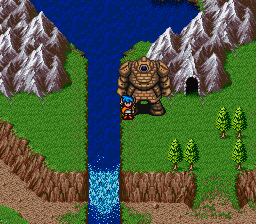 So, if you want a great Super NES RPG with colorful graphics, great sound, fun sidequests, many hours of play, and some of the most memorably quirky party members since The Magic of Scheherazade, there are only a handful better to recommend than Breath of Fire.